The Commander’s House is one of the main buildings here. It’s a large ‘mansion’ which was built in 1725 for the commander of the fort and is still used as a military residence today as it houses the Danish ‘Chief of Defence’. The church stands right at the heart of Kastellet, which means Citadel in Danish, and the red building attached to it is the former prison. This was built 20 years after the church in 1725 and enabled prisoners to follow services through ‘peep holes’. Other notable buildings are the gatehouses at each end, the military housing known as ‘rows’, the storehouses which had everything you’d need to feed 1800 men if the fort were under siege and the windmill which is up the hill behind the church and helped the fort to be self sufficient. Another way to see the fort is to walk along the high banks all around it. Simply follow the walkway and you’ll get a great view of the fort, the harbour and notable bits of Copenhagen too. 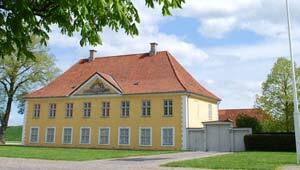 Admission to Kastellet fort is free and the gates are opened to the public from 6am to 10pm daily.